Kim Kardashian reveals daughter North is already designing her own clothes | HELLO! Not content with trying on her mum's clothes, Kim Kardashian and Kanye West's daughter North West is now starting to design her own. The Keeping Up with the Kardashians star has revealed that North designed her own dress during a visit to Kanye's design office on Tuesday. Kim made the revelation on Twitter in response to Fashionista, who described North as a "little fashion icon". "She designed her own dress today in her dad's office & is picking out fabrics tomorrow! She loves fashion!!" the proud mum replied. 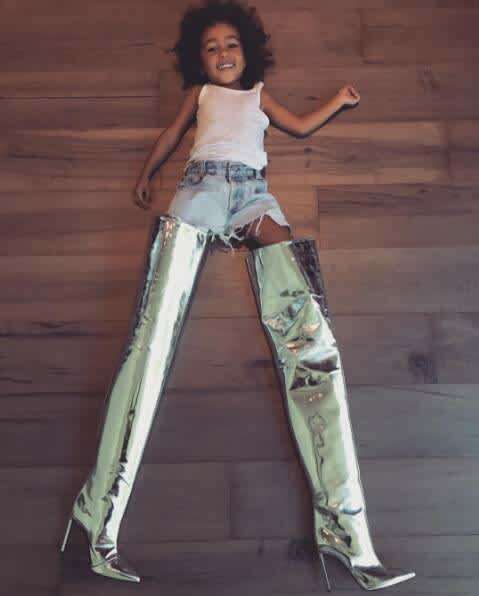 North is only three, but she already has a keen interest in fashion and recently tried on her mum's thigh-high metallic Balenciaga boots in an amusing snap shared on Kim's Instagram account. "Didn't think it would happen this soon… my baby girl stealing my shoes. At least she has good taste #Balenciaga," Kim captioned the photo, which showed North giggling as she lay on a wooden floor with her legs in the boots. The reality TV star is also saving all of her gladrags for her little girl, including some of her most famous red carpet gowns. "Someone said to her the other day – she was wearing a little slip dress and a choker – and they said, 'Oh, you look so cool,' and she's like, 'I'm not cool. I look pretty. This is a pretty dress. It's not cool.'" Kim said. "So she's very into things having to be pretty colours or pretty jewellery."